OF Torii Hunter leaped, and the baseball appeared to bounce off his glove, but he went head-over-heels into the dugout without the ball in hand, and Big Papi had tied the game at "five". Everywhere you look at this season thus far, things are coming up "fives" for Lehigh. 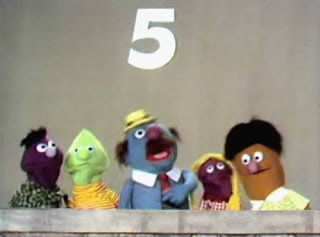 For many of us, our first introductions to the number 5 comes from Sesame Street and the Muppets. For Lehigh fans, we were introduced to Lehigh's "fifth" win of the season after a 24-10 win over winless Columbia . How did that "fifth" win happen? Just as in many of Lehigh's games this season, it was done through the air, despite the fact that Columbia's Robert A. Kraft Field, near the very upper tip of Manhattan, seemed to resemble a wind tunnel more than a football stadium by the time the game was nearing its conclusion. Senior QB Brandon Bialkowski topped 50 passing attempts on Saturday - there's that number "five" again. He's topped that number of passing attempts two other times this season: vs. Princeton (a win) and vs. New Hampshire (a win). BB is averaging 368.3 yards per game and has amassed 2,174 total passing yards on the year, which is good enough for No. 2 in all of FCS, putting him - yes - in the Top "Five" in the country in those statistics. There's also a lot of "fives" involving BB's favorite target, senior WR Lee Kurfis. His closest competition at No. 2 in both categories, Eastern Illinois WR Erik Lora, averages 23 yards less per game, and also is 137 yards behind Kurfis in total receiving yardage. BB's incredible passing efficiency, as well as a primary BB-to-Kurfis pass-receiver combination that is firing on all cylinders, is a huge reason why Lehigh has those "five" wins. Another place where a "five" comes into play is red zone efficiency. All season, the offense has only come empty "five" times in that area of the field. In 31 opportunities, they've come away with points 26 times, or an amazing 83%. Interestingly, three of those red zone misses came last Saturday: two ended with interceptions, and the third finished with a half-ending FG attempt by freshman PK Ryan Pandy that hit a wall of wind and blew a good-looking kick off course. A lot of that incredible red-zone efficiency, too, has to do with a good complementary running game. So does senior RB Sean Farrell, with 153 net rushing yards and 7 TDs on the season. When you look at the Lehigh stat line, you don't see an overpowering run game, but that's deceiving. The Air Lehigh system isn't one that relies on backs getting 35-40 carries a game. It's one where the backs are delivering first downs and scores, and on that score the Mountain Hawks are doing a pretty good job, with 10 TDs and some really huge 4th down conversions. Lehigh is 8 for 8 on the season in that category. That's not to say everything is puppy dogs and ice cream. Lehigh's defense have only technically forced "five" turnovers this year, counting a forced fumble on an BB interception by Sherman, recovered by New Hampshire. The Mountain Hawks have only forced four interceptions, and recovered two fumbles, one which was a huge play by senior FB Zach Hayden when he alertly grabbed a muffed kickoff return last weekend for one of Lehigh's rare takeaways on the season. Paired with BB's 8 interceptions and 4 lost fumbles, Lehigh is averaging -1 turnovers a game through the halfway point of the season. Arguably, that statistic is what did in the Mountain Hawks against Fordham two weeks ago, when a misplayed punt return was turned into points and the Rams never looked back from there. Senior S Tyler Ward is having a great season thus far, with 52 tackles and 2 of the Mountain Hawks' 4 interceptions. But no other Lehigh defensive player is anywhere close to approaching his tackle total on the season. Sophmore LB Noah Robb and junior DE Tim Newton come closest with 35 and 34, respectively. There's also "Total Defense", where Lehigh ranks 105th out of 122 FCS schools. As a unit, the Mountain Hawks are surrendering 465.8 yards per game. 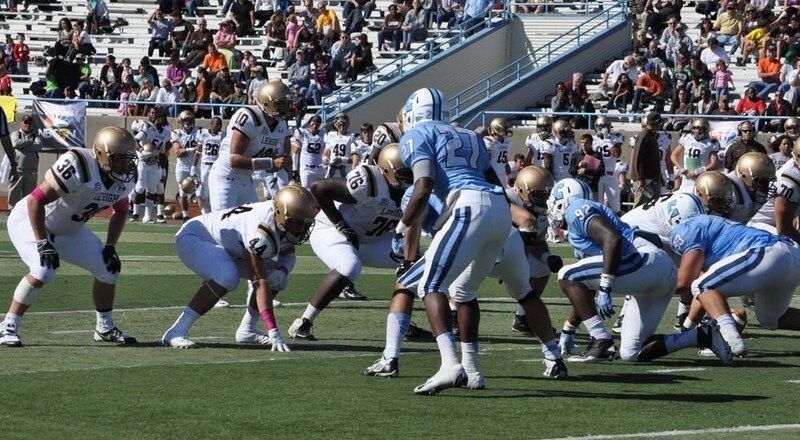 On the ground, Lehigh ranks 100th, giving up 222.8 yards per game on the ground. Last week, they gave up 150 yards to a pretty good back, Columbia's RB Marcorus Garrett. Last week was a step in the right direction for the defense, and certainly they are to be commended for holding the Lion offense, as sub-par as they've looked this year, to only 10 points. But in order to get the ultimate goal of a Patriot League championship and a return to the playoffs, Lehigh needs to get better in these areas. Do they need to be "five" times better? Maybe not, but the Mountain Hawks can't afford to let up, as you'll see. The Mountain Hawks, of course, have "five" Patriot League opponents that currently count in the league standings. That means the success or failure of the football season is very likely to hinge upon how the Mountain Hawks do in these "five" critical games to end the year. One is 1-5 Colgate, and the other is 1-5 Georgetown. How close was Lehigh from the same fate as Colgate or Georgetown this season? It's pretty easy to picture Lehigh losing four of those "five" games that were Mountain Hawk wins - maybe even all "five." Against Central Connecticut State, Princeton, and New Hampshire, Lehigh overcame double-digit deficits to overcome the odds and come away with victories. One tiny mistake, one missed pass, one extra turnover, and those are losses. Against Monmouth, Lehigh needed the help of a 37 yard blocked punt fielded behind the line of scrimmage by Hayden to keep a drive alive. It's incredibly easy to imagine that game having a very different ending. Even this weekend, against Columbia, the Lions were down 17-10 with the ball in a position to tie. Unlike the others the Lions never really had the game in hand, but what if QB Kelly Hilinski had connected on a big play and tied the game? Would Lehigh, having lost momentum in the Bronx just last week, lost it again and gone down to defeat? Looking at Georgetown and Colgate it's easy to get a sense of what could have been. Georgetown came within a whisker of defeating last year's NEC champs, Wagner, before beating one of the worst non-scholarship FCS teams in the subdivision, Davidson. Since then, they've been going through quarterbacks at an alarming rate, while falling to both Princeton and Fordham by double-digits in back-to-back weeks. Colgate started their season at Air Force, a rare FBS game, before navigating a brutal out-of-conference schedule that included three CAA teams, New Hampshire, Albany and Stony Brook, and a surprisingly strong Ivy League team, Yale. Only a win over arch-rival Cornell kept the Raiders from going 0-6. Lehigh could have easily lost to New Hampshire and Princeton, and did lose to Fordham. Had that happened, Lehigh would have been 3-3 right now with a very different outlook on life. Two of the other teams they'll face down the stretch have played "five" football games thus far. One is Bucknell, who is 1-4 and has already lost two conference games. Another is 1-4 Lafayette, whose sole win came against Bucknell. Last week, Lafayette lost to Princeton by double-digits, too, putting in perspective Lehigh's accomplishment in beating the Tigers on the road. It's a highly unusual year where four teams sit with only one win apiece, which will do the Mountain Hawks no favors nationally if they beat them. That's critical if there's still anyone out there that thinks that Lehigh could sneak into the playoffs with an at-large bid if they somehow lose a conference game during the rest of the season. If Bucknell loses to Dartmouth and Lafayette loses to Harvard this weekend - and they'll be underdogs in both games - all four of these teams will be one loss away from losing records on the season, and it's a guarantee, even taking Lehigh out of the equation for a second that at most one of these teams will have a winning record by the end of the year. Imagine trying to convince someone that a Lehigh team with a loss to, say 3-8 Bucknell is worthy of consideration over a team that beat, say, Northern Iowa. It's not even a guarantee that a win over Holy Cross, who currently sits at 3-4 with losses to nationally-ranked Harvard and Towson, would help the Mountain Hawks in the eyes of anyone if it came to the benevolence of the folks picking the FCS playoff field. That's not to say these "five" games against Patriot League foes are going to be cakewalks - far from it. Think again how close Lehigh was to being 1-5 this season. It's not hard to think of four plays, going the other way, making that a reality. If that had been the case, how would you, as a Lehigh fan, have thought about entering Patriot League play? You'd think about it the same way Lafayette, Holy Cross, and Colgate are thinking of it right now. They see themselves with a 0-0, or 1-0 league record, and a path to the playoffs. They look at the competition, and see a bunch of other 1-win teams. All winnable games. They look at Lehigh, and see a team that isn't all that far from 1-5 themselves. They see Lehigh as a winnable game. Sure, they see Lehigh players atop the FCS statistically. They see the national rankings. They see the games on national TV. And they see a path to the playoffs, and one that is not at all insurmountable. And any one of these "five" will be dogfights. It's easy to get caught up in numbers, and count up all the "fives" and see Lehigh heading to the playoffs, even if they slip up on their way through the league. But nothing could be further from the truth. Lehigh needs to keep up the pressure, and count up to "five". It's the only way they win the Patriot League autobid and return to the playoffs.